Shakedown is a post-divorce film for me. Not my divorce because I’ve never been divorced. No, the post-divorce of my mother and father. There are many films that populate this list. They include and not limited to; Predator, Extreme Prejudice, Lethal Weapon, Darkman, The Hidden, The Man with One Red Shoe, Teenage Mutant Ninja Turtles, Batman, Die Hard, Crocodile Dundee, Hiding Out and… Shakedown. Why does one ask? Because it was a film that was indelibly one parent’s film. Shakedown was the ultimate dad film. I still remember my father and his roommate Greg watching Shakedown every weekend along with Lethal Weapon. It was their go-to film double features. As a kid, I always understood the allure of Lethal Weapon but not so much Shakedown. Now, I’m not sure how I ever missed the grand stupid brilliance that is Shakedown. The setup is simple. A lawyer named Dalton (Weller) on his last week before he joins the yuppies on Wall Street is to defend a drug dealer is being held accused of murdering a cop. The drug dealer leads Dalton and Texas-born NYPD Richie Marks (Elliot) down a rabbit hole of corruption and dirtbag cops. Many deaths, chases and reveals finds Dalton and Richie spending much of the last week of Dalton’s defender career evading murder or worse frame-ups. Now, yes from the above statement one does ask what makes Shakedown a great action film rather than a standard one. Its writer/director James Glickenhaus’ style and enthusiasm for the genre itself, and the near-lunatic cartoon-style action scenes. The action has a daring “go big or go home” style and bravado that would make even the most boisterous of an Italian Poliziotteschi directors envious (there’s even a blatant reference to Suspicious Death of a Minor that had me laughing). There is a moment towards the end that is so deliriously stupid and brilliant involving a Lear Jet, a Porche, and Sam Elliott that defies expectations. In the best way that summarizes exactly what makes this film better than even the best of the Buddy Cop Action genre of the 80s. Glickenhaus also knows the genre and the clichés like the back of his hand. Much of Shakedown subverts those clichés just enough to rise it above ranks of other similarly plotted movies putting it into the Lethal Weapon territory of greatness. Yes, I did invoke LW but with good reason. Glickenhaus with his leads and his bad guys have created a cop film that’s actually aged better than 90% of its counterparts. Thanks in large part to some (not all of it is) progressive almost anti-80s political stances. Watching Shakedown one wonders why people of the era did not warm to this film. Their loss is our gain as Shakedown is sure to become a neo-classic for the action film geeks. Shakedown is by far one of the best catalog transfers Shout Factory has done. The film has always felt washed out in previous iterations on home video. Shout corrects that with a beautiful color corrected transfer that makes all of the neon-hued nights really pop. The film may have a bit more DNR than for my tastes but that does help the film look shiny as possible which is a benefit. To further convince you that Shakedown is one of the best 80s action films you haven’t seen is a plethora of extras to show you the error of our ways. The intro is 60 seconds with Glickenhaus thanking you for watching a film done in a style that “doesn’t get made anymore”. Indeed, James, indeed. The commentary is a low-key affair with Glickenhaus discussing the nuts and bolts of filming the production and discussing how things came together after his first two films were successes. Shakedown Breakdown is a thirty-minute interview with Director Glickenhaus that covers much of what wasn’t discussed in the commentary. The majority of the interview is discussing where the idea sprouted from and the putting together of the story itself. Miles over the Limit is a brilliant bit of storytelling as Glickenhaus recalls how he helped jazz legend Miles Davis (yes, that Miles Davis). The story is classic 80s lore that involves a Lamborghini and other illicit materials. Best kept for one to actually watch the interesting featurette. 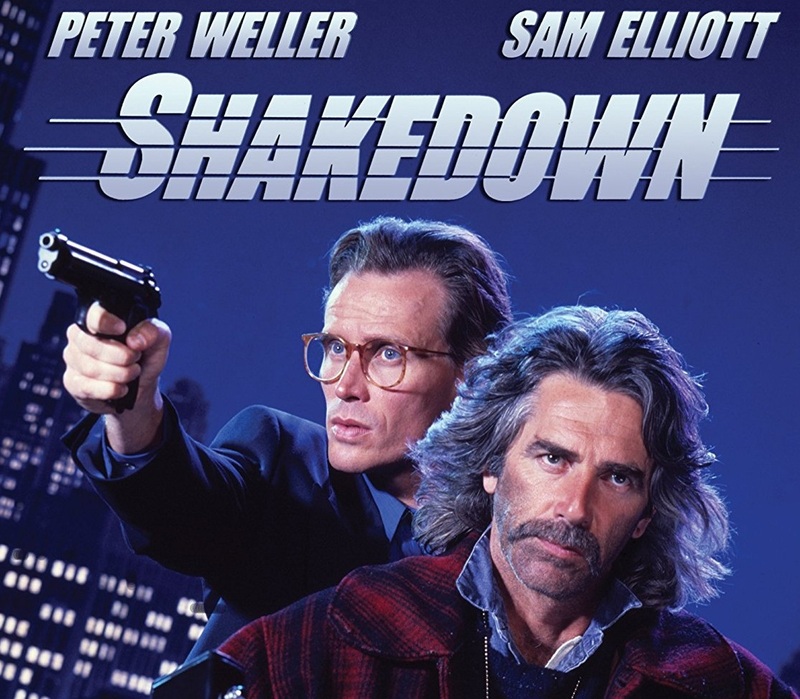 Shakedown is an undiscovered 80’s action classic waiting to be … well discovered. Thankfully Shout Select has put together a great package for fans and non-fans alike. The film, the transfer, and the extras are too sweet of a package to pass up. High recommendations! Shout Select’s Blu-Ray edition of Shakedown is available January 23rd from Shout Factory!